Chocolate Almond Cupcakes with Salted Caramel Vanilla Buttercream recipe. 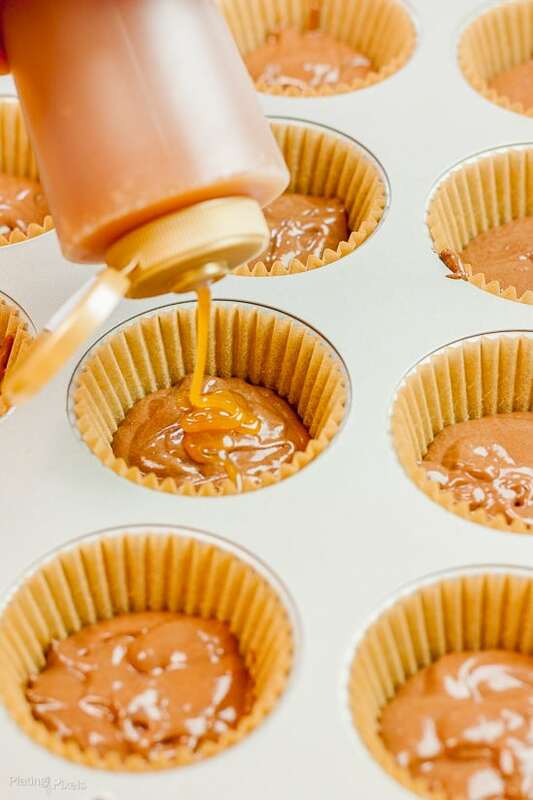 Easy homemade cupcakes from chocolate cake mix with sea salt caramel topping. This shop has been compensated by Collective Bias, Inc. and its advertiser. The recipe idea and all opinions are mine alone. We recently celebrated Olia’s birthday. What’s that mean besides one more year of knowledge and experience? Cupcakes! We went out that night for a Greek dinner and dancing with friends. 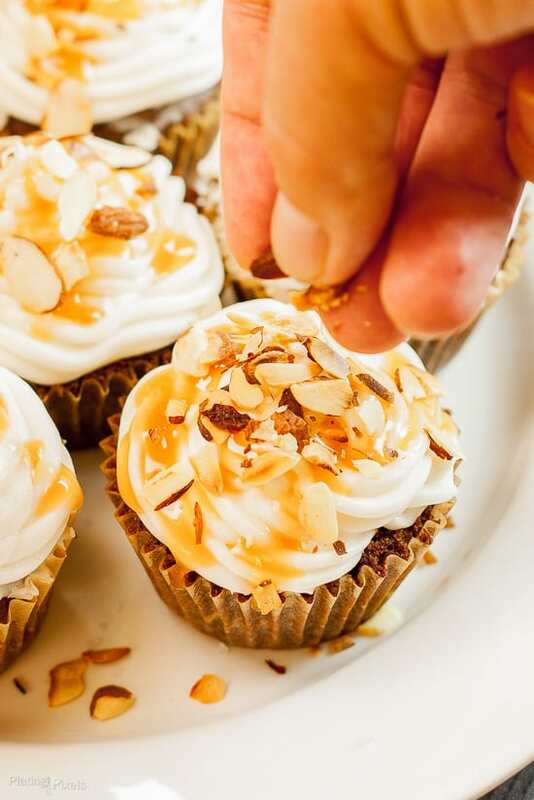 I thought a fun and impressive dessert like these Chocolate Almond Cupcakes with Salted Caramel Vanilla Buttercream would be a perfect way to celebrate. I traditionally excel at grilling and savory dishes, but still love making desserts. 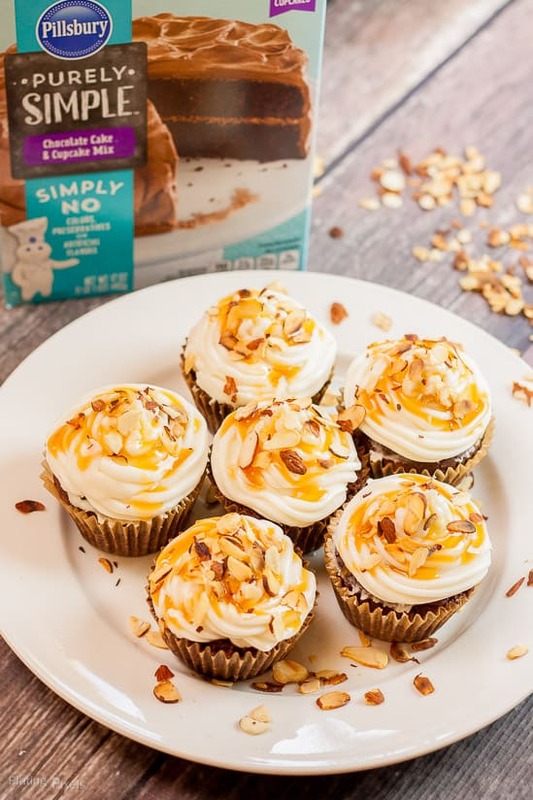 These homemade cupcakes were super easy thanks to the new Pillsbury Purely Simple Cake and Frosting mixes, which are available at Target in the baking and oils section. I was able to make these decadent chocolate almond cupcakes, with buttercream, the afternoon just before the birthday fun. The fact that these are homemade, and without artificial colors, flavors, or preservatives, makes me proud to share these with friends. All you need is the mixes and a few extra ingredients, like butter, eggs and milk. I’ve adapted and modified these to make them extra special. Almond extract in the buttercream complements the rich toasted almond topping. Caramel sauce inside AND on top make these a dreamy and beautiful dessert. Just follow the directions to make the batter and fill cupcakes liners slightly. Fill centers with caramel sauce, then top off with batter. Bake till fluffy and moist. 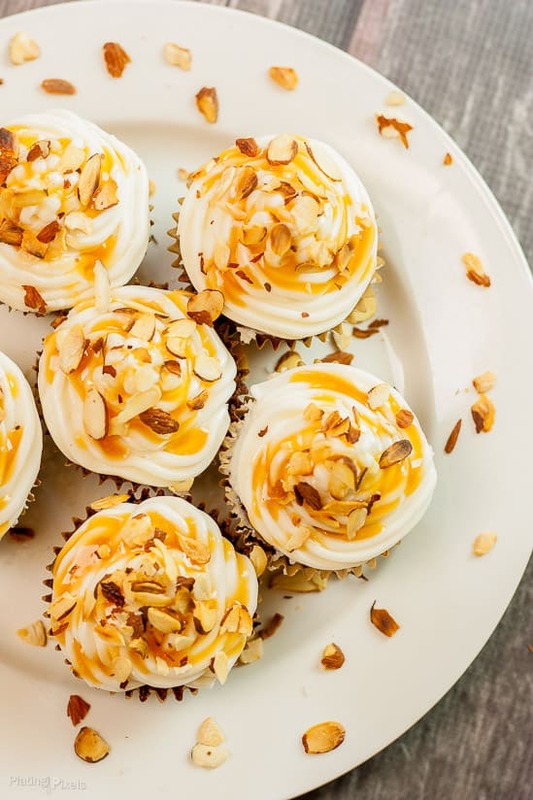 Top with the easy to make vanilla buttercream, almonds, and salted caramel. The easy to follow directions below will quickly guide you through making these cupcakes. This means homemade desserts with less hands-on work, and more time celebrating with friends and loved ones. Toasting nuts is simple. Even if a recipe doesn’t call for it, I suggest always toasting nuts for extra flavor. Heat almonds in a small pan over medium heat, stirring often, for about 5–7 minutes, until slightly browned and fragrant. Be careful to not overcook. Remove almonds from pan immediately and place in bowl or plate to cool; otherwise the residual heat will continue to cook and burn almonds. Dietary Options/Substitutions: If you have nut allergies, omit sliced almonds. Replace almond extract with orange extract. Notes: If you want larger frosted tops (like the photos), I suggest doubling the buttercream frosting. 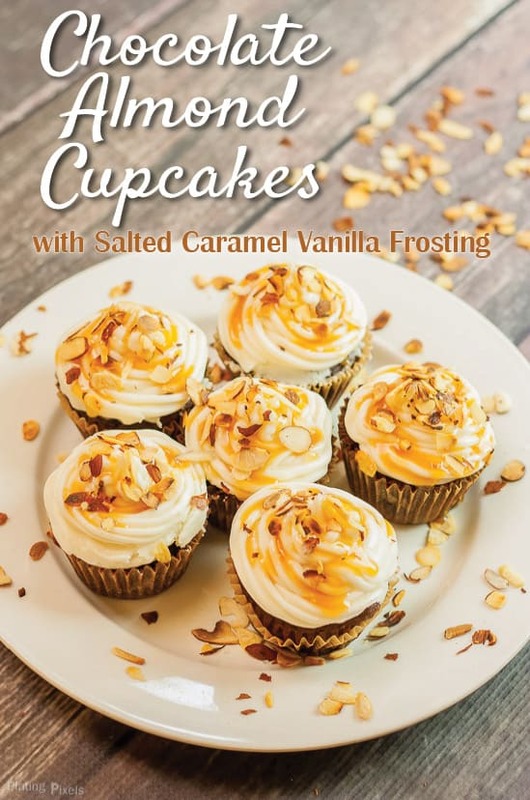 Easy homemade cupcakes from chocolate cake mix with sea salt caramel topping. Preheat oven to 350º F. Line muffin pan with 15 regular size liner cups. 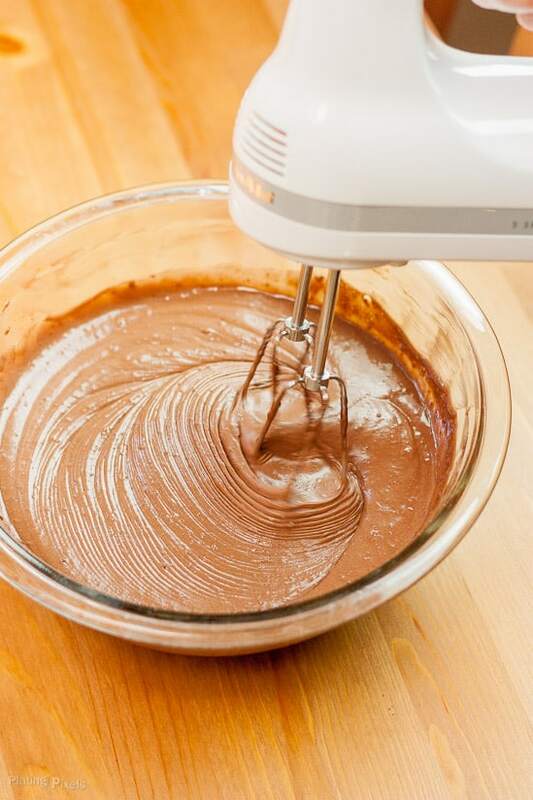 Using a stand or hand mixer, beat together cake mix and ½-cup softened butter on medium until just combined. Add milk and eggs. Slowly mix to combined, then beat on medium-high for 3–4 minutes until batter thickens. Fill each liner with batter about 1/3 full. Add about 2-teaspoons caramel sauce in center of each; then fill just under 2/3 full with remaining batter (cupcakes will rise). Bake for 19–23 minutes, or until a toothpick inserted in center comes out clean. Remove from pan and cool completely on a wire rack. Meanwhile to make buttercream frosting: Using a mixer, beat together frosting mix and remaining ½-cup butter in a large bowl. Slowly beat in water and almond extract until combined. Use more or less water to reach desired thickness. Pipe or spread buttercream on top of cooled cupcakes. Drizzle with extra caramel sauce. Top with toasted almonds (see cooking tips above) and sprinkle with sea salt. Store covered in fridge. Let sit at room temperature for 15–20 minutes before serving. I’d say at least two is necessary. Thanks Trish! These look and sound lovely! I love the almond being added to the salted caramel combo. That’s different and totally delish. I am pinning this one. I need these cupcakes in my life! Thanks for sharing! Glad you like them Sarah! It was the most simple, yet decadent, combo I thought of for these. Thank you! These look amazing! I love the almonds on them. I’ll have to bring them to our upcoming family parties. They will also be great for the holidays. Thanks so much Meagan! They’d totally be a hit if you did. I’ll have to look for those cake mixes. I like that there’s no preservatives or artificial flavorings. That’s why I was happy to suggest these. About as close to homemade as you can get. Thanks Lydia! Thanks Michelle! The caramel is a subtle, fun surprise. They totally were! Chocolate and almonds?? Yes, please! These sound wonderful! Chocolate and almonds…Yes indeed! Thanks Sheena! You totally had me at buttercream. It is my all-time favorite frosting-replacement! I agree Scott. It’s a little more classy than frosting and oh so yummy. Thanks! I love almond and caramel! Yum! Well that’s perfect then Lucy. Thanks! Salted Caramel is my absolute favorite! This sounds so amazing! It’s one of mine too. Such a great pairing. Thanks Debra!